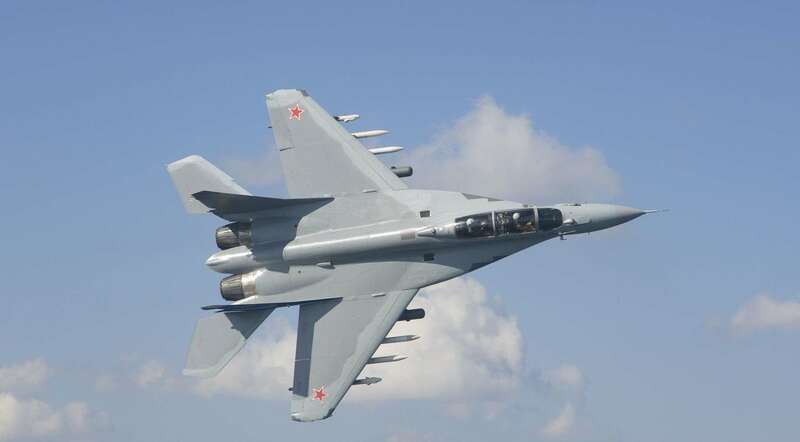 India, Kazakhstan, Peru and other countries may place big-ticket orders for the advanced Mikoyan MiG-35 (NATO reporting name: Fulcrum-F) fighter jet, MiG Corporation Director General Ilya Tarasenko has told the Echo Moskvy radio station in an interview. “We are ready to enable our customers to gradually transit from the MiG-29 [Fulcrum] to the MiG-35. Now, we are working proactively on the aircraft’s promotion. I guess major buyers may be India and Kazakhstan, and Myanmar, Bangladesh, Malaysia, Peru and Algeria as well,” he said. The MiG-35’s life cycle cost is 30-40% lower than that of its foreign analogs, Tarasenko emphasized, with the type’s unit price to be some 20% lower than theirs. According to Tarasenko, the MiG-35 is capable of using all air-launched weapons in the Russian Aerospace Force’s (RusAF) current inventory. “Laser weapons imply using a laser technology. Our aircraft employs the whole spectrum of the up-to-date weapons available to the Defense Ministry, including lasers,” he said. Previously, RusAF Commander-in-Chief Colonel General Victor Bondarev had mentioned the feasibility of the MiG-35 using laser weapons. Tarasenko said the MiG-35’s tests would take around two years. “We have planned its trials for the coming two years. No contract [for the full-rate production] has been awarded yet. We have got the one for the developing of the aircraft,” the director general explained, stressing that the corporation had built two prototypes and launched their testing under the current contract. “The aircraft has been doing fine in the trials, and I believe we are on schedule as far as the tests are concerned,” he emphasized, adding that the company’s test pilots have been evaluating the MiG-35’s handling characteristics. “Now, we are looking into its flight characteristics and testing its control system. Naturally, the test program includes the employment of airborne weapons of all types,” Tarasenko said. According to the MiG Corporation director general, a fifth-generation light fighter for the RusAF will be developed concurrently with the joint development of an advanced aircraft by Russia and the United Arab Emirates. “It will be designed for the [United Arab] Emirates, while another version with improved characteristics will be submitted to the Russian Defense Ministry,” Tarasenko said. Earlier, Rostec Director General Sergei Chemezov had said Russia and the UAE would start co-developing a fifth-generation light fighter jet in 2018. MiG Corp. said in 2015 that it carried on working on the fifth-generation light fighter despite the lack of orders. Reportedly, the MiG-35 may serve the base for the aircraft. At the same time, the United Aircraft Corporation said the light fighter was not on its priority list. I also love MiG-35 so much.